Fri, January 25, 2019 6:00 P.M. Celebrate the Bard of Ayrshire, Robert Burns, with a raucous evening of readings, music, and whisky! This event is for ages 21 and up. A whisky tasting will be included with admission. Seating is limited, and advance registration is strongly recommended. 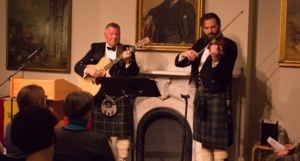 For tickets, visit https://rosenbach.org/events/performance-burns-night/.